The Goat House is one of the few places that has managed to succeed at it all: breakfast, afternoon and evening drinks, lunch, dinner, and, of course, coffee. 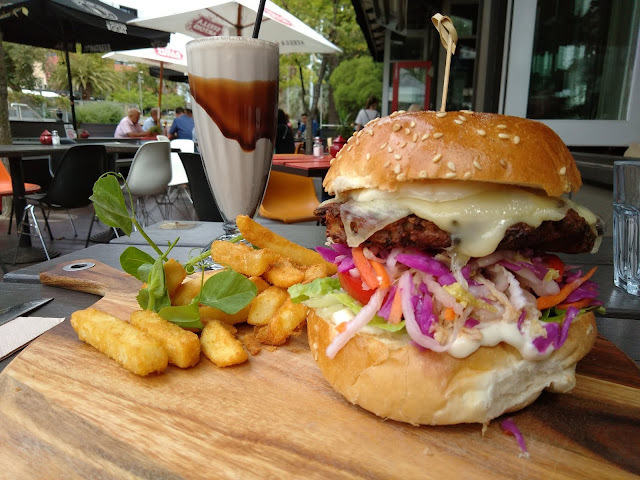 Located on the popular Glen Huntly Road in Elsternwick, it looks more like a pub than a local coffee shop for a strong latte before your morning commute. Yes, the station is opposite. There is a pleasant courtyard at the front with plenty of umbrellas to protect you from Melbourne’s harsh sun. And a specious indoor area centred around a fully stocked bar. It is likely the only place you will still find busy at 2pm on a weekday along this road. There are several vegetarian option on the menu, and craving carbs, I opted for the veggie burger. 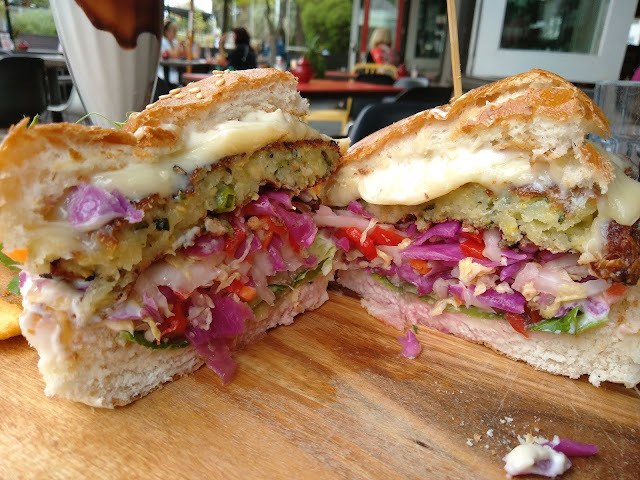 Made with halloumi, peas, and zucchini, it has been fried and they accompanied with pickled cabbage, carrot, and red capsicum; lots of Swiss cheese; lettuce; tomato and mayo. All this is layered between a toasted brioche to make it totally unhealthy and high on the calories, but equally, totally delicious. As if that was not enough calories, I also had the chocolate milkshake. This was frothy with lots of ice-cream and decorative topping on the sides. It was Tuesday arvo. Goat House was serving middle-aged women drinking wine, business meetings, and hungry people like me. The staff were professional. The food was tasty. The space was pleasant. It was slightly expensive, but the servings are large and the food good.